What kid doesn’t love an explosion?! My kids absolutely love seeing fireworks, no matter the time of year. They oohed and aahed over the fireworks on New Year’s Eve, and they’ll do the same when we head to the park to watch the fireworks display on the Fourth of July. 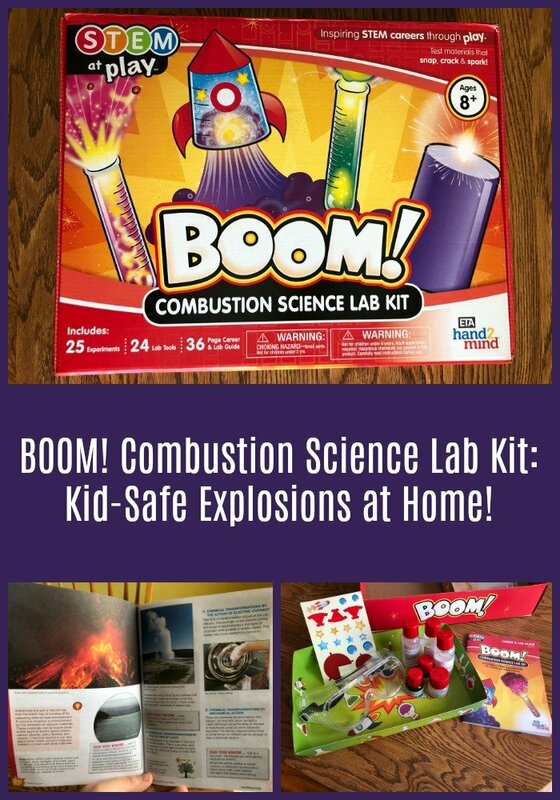 Now you and your family can create your own family-friendly explosions on a much smaller scale (but still exciting!) with STEM at Play “BOOM!”. 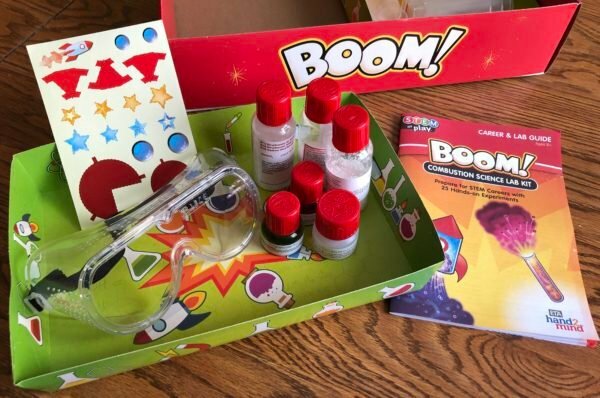 This kit offers twenty-five kid-safe experiments and DIY projects that celebrate our fascination with explosions. Creative kids and families can hone their STEM skills, discover the wonders of combustion science, and enjoy hours of hands-on fun as they create and detonate celebratory sparklers, rockets, fizzy bombs, and more. The kit is for kids ages 8 and up (with adult supervision), so I worked on it with my very excited 9-year-old son while my girls watched. It includes a 36-page lab guide with clear instructions for 25 explosions. 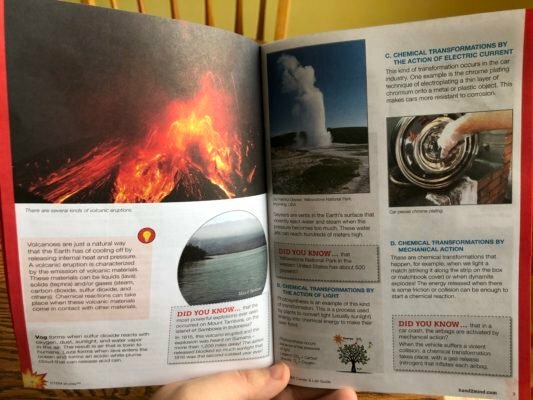 I like that the beginning of the book outlines the chemistry for how explosions work, and it also highlights a few careers that use these concepts in their day-to-day operations. My son was excited to get started! We actually did a few experiments in about 10-15 minutes. However, some of the experiments are more time-consuming, so don’t worry that you’ll breeze the whole thing in one day. We’ll also need to put some projects on hold until we can get outside (considering it’s January…and I live in Minnesota…) but that will be a lot of fun. I like that the book clearly labels certain experiments as needing to be done outside with parent supervision and/or with personal protective equipment like goggles and gloves. You will have to use a few household items that aren’t included in the kit for some of the experiments, but they’re pretty common items and you shouldn’t need to make a special run to the store. Of course, if you don’t have the necessary items in your home at the moment, just save that one for another time! 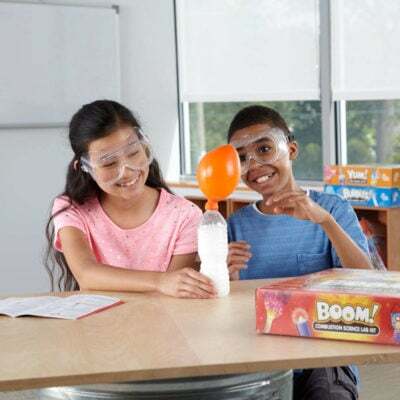 Besides this one, other experiments include fizzy bombs, inflating a balloon without blowing, a lava lamp, birthday cake sparklers, a rocket balloon, and more! Get in on the fun with the BOOM! 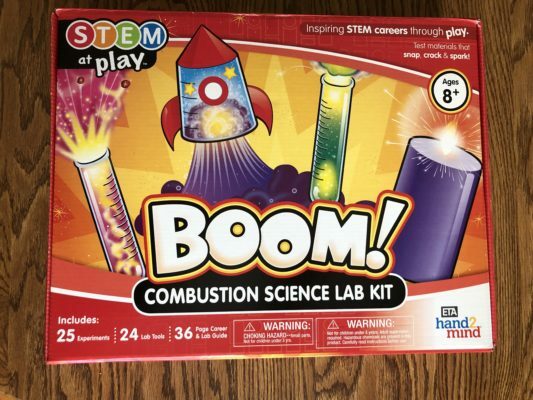 Combustion Science Lab Kit. This would be a great gift! It looks both fun and educational! This is an awesome set that is fun and educational. I will certainly keep this in mind for a birthday party gift for family and friends. This would be so fun to try at home with my grandson! He really enjoys science experiments at school, so I know he would enjoy this at home! This looks like a really fun kit!! This looks like it would be great for being a mad scientist!